In the sequel to the highly acclaimed Few Returned, Eugenio Corti, one of Italy's most distinguished post war writers, continues his poignant account of his experiences as an Italian soldier in the Second World War. In the earlier book, Corti, a twenty-one-year-old lieutenant of artillery, recounts the horrifying experience of the soldiers who were sent to Russia to fight alongside their German ally. On the River Don, the Red Army surrounded Corti and 30,000 other members of the Italian force. Corti was one of only an estimated 4,000 soldiers to survive that ordeal. Mussolini's dreams of empire were shattered, and his ill-fated Eighth Army no longer existed. In 1943, after recurrent military defeats, the Italian government and its king, Victor Emmanuel III, forced Mussolini to resign. Italy then signed an armistice with the Allies and ended its alliance with Germany. The Germans immediately occupied northern Italy, which the Axis still held, and reinstated Mussolini in the north. Some Italians remained loyal to Fascism; many others aligned themselves with the Allies, who were now advancing in southern Italy. Corti's sympathies were with the Allies, and after a harrowing escape from the German-occupied north, he rejoined the Italian Army fighting on the side of the king. 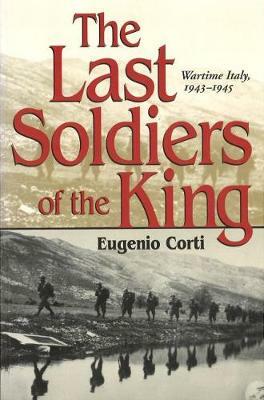 The Last Soldiers of the King is Corti's account of the Italian Army's experiences fighting the Germans during the remainder of the war. In this unforgettable narrative, Corti depicts the war from the perspective of the average Italian soldier, capturing its boredom and absurdity along with brief periods of savagery, terror, and death. Painting vivid pictures of the sights, sounds, and smells of war, he shows how these men fought alongside the Allies against the Germans. They fought without hatred, driven by a sense of duty and love for their country and a desire to quickly put an end to a war that was destroying so many lives. Corti superbly relates the wandering of the remnant of Italian officers and men as they sought to reestablish themselves as Italian soldiers. The Last Soldiers of the King tells the story of a proud people forced to endure death, poverty and the virtual destruction of their nation.